Download audio of this case here. Download case as a PDF here. Sepsis is a regular visitor in the news as cases of flesh-eating bacteria and the dramatic speed with which victims deteriorate hit the headlines. The failure to diagnose sepsis remains a critical issue as delays in diagnosis significantly increase morbidity and mortality. The entire emergency department, urgent care and primary care teams must be focused on early recognition and intervention. This has never been so important as today since evidence now points to interventions that can truly save lives. Today we present perhaps the most challenging of cases. The flesh-eating bacteria-related cases are only obvious in retrospect. At the outset, there is an event such as a small cut while in the water harvesting seafood, a bump or bruise from a car door, or simply the onset of pain that is perhaps related to bacteria entering soft tissue through a small cut or abrasion the individual may not even be aware is there. The pain increases rather dramatically, and the individual ultimately seeks care. At first glance, there is little or nothing visibly apparent; maybe there is a bit of swelling or redness at the site, but no evidence of something significantly wrong. We present one other issue in this case review. We continue to look for the best markers for early sepsis. Until recently, practitioners used a sepsis screen using SIRS criteria. Some experts now recommend abandoning that thought process and applying the quick SOFA criteria (qSOFA). The use of both protocols are presented in this case; it is interesting to evaluate which would have been more helpful in making an earlier diagnosis. 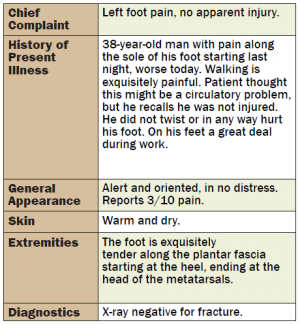 A 38-year-old man presented to the emergency department with a complaint of left foot pain. The emergency physician ordered taping of the foot, crutches, ice, elevation, and anti-inflammatory medication. The patient was discharged with follow-up with his primary care physician in 2 days. The patient followed up with his primary care physician as directed 2 days later. At the office, the nurse noted that the patient had severe swelling of his left foot and ankle, with pain radiating upward to the knee and into the left thigh area. His blood pressure was 114/80; his pulse rate was 136 beats/min. The primary care physician noted that the patient woke up 2 days prior with left foot pain, which progressively worsened. X-rays were negative. He was treated with Ibuprofen for plantar fasciitis and remains on crutches. His pain is increasing with swelling in the left foot, and he cannot bear weight secondary to the pain. On physical examination, marked swelling/bruising of the left foot with decreased range of motion is noted and is secondary to pain. No warmth or redness is observed. 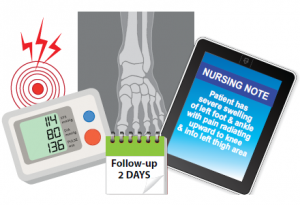 Pulse rates are good, and a repeat X-ray reveals no fracture. The pulse rate had gone from 116 beats/min during the ED visit to 136 beats/min in the primary care physician’s office. The office staff never took the patient’s temperature. Do you think the office staff had an obligation to take a full set of vital signs? Probably. The primary care physician never documented recognition of a pulse rate of 136 beats/min. Do you think he would have discharged the patient had he looked at the nursing note? Probably not. Hopefully not. Consider that the patient’s resting pulse rate from prior visits was in the mid-60s and was more than twice that number during the office visit. Even if the possibility of sepsis did not come to mind, every practitioner should recognize that something is seriously wrong in this case. Taken together, the ED diagnosis and the office diagnosis do not make sense. 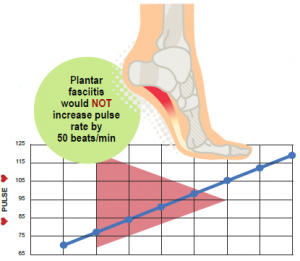 No patient has a plantar fasciitis that extends up and develops into a sprained ankle. In addition, there was no history of injury. The primary care physician clearly missed an opportunity to consider the diagnosis of sepsis or recognize that there was a significant physiologic abnormality and get help. The next day, the patient called the primary care physician’s office complaining of increased swelling and redness. The primary care physician now considered the possibility of cellulitis and started the patient on an appropriate antibiotic for cellulitis. He missed the opportunity to consider the possibility of a far more serious infection. The patient returned to the same ED the next day complaining of redness and swelling to the left foot and ankle. The emergency physician dictated the patient’s history and physical examination. On physical examination, the patient was markedly diaphoretic. There was marked edema, erythema, and increased warmth to touch from the toes to the knee. There were large confluent vesicles over the dorsal and lateral aspect of his left foot and hemorrhagic vesicles on the lateral aspect of the foot. The WBC count was over 40,000. The patient was admitted with a diagnosis of cellulitis. In the ED, he was started on Rocephin (2 g IVPB). 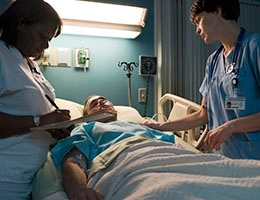 During the hospital admission, the patient was seen by Surgery and Infectious Disease. They agreed the patient had necrotizing fasciitis and compartment syndrome. He underwent debridement and irrigation of the left leg and foot, decompression, and fasciotomy. The wounds improved. Cultures showed Streptococcus Group A. The patient had a second operation for definitive debridement. 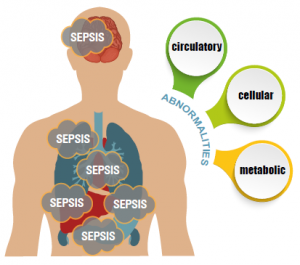 What were the early indicators of possible sepsis? How can the practitioner recognize early signs of the septic process? During the first visit to the ED, the patient had pain out of proportion to any apparent mechanism of trauma or injury; he also had a pulse rate significantly out of proportion to body temperature. There was extreme tenderness on the plantar aspect of the left foot. Was it a breach in the standard of care to fail to diagnose sepsis at this point? Perhaps not. Was it possible to recognize that there was a significant physiologic derangement, that something significant was happening and the patient needed further testing or consultation? Probably yes. 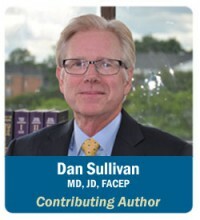 The first visit simply did not add up to plantar fasciitis. Like many cases involving an adverse patient outcome, there were red flags and significant markers for a disease process. Practitioners must recognize that pulse rate abnormalities reflect dramatic physiologic changes. Plantar fasciitis would not increase this man’s pulse rate by 50 beats/min. Early on, there is often no visually apparent site of infection. There is usually a vital sign indication reflecting a significant physiologic abnormality that precedes other findings. There is often pain or a symptom out of proportion to mechanism, or no mechanism at all. The physician’s diagnosis does not connect the dots with a diagnosis that explains the presentation. What should have happened during this first visit? Standard of care aside, this emergency physician should have recognized the physiologic abnormality and observed the patient over a period of hours. If the patient’s condition did not normalize, he should have been observed or admitted for further evaluation. The nurses should have repeated vital signs according to department protocol and should have alerted the emergency physician that he was discharging a patient with abnormal vital signs. What should have happened during the office visit? The primary care physician should have recognized that the pulse rate of almost 140 beats/min was dramatically abnormal. He should have recognized that plantar fasciitis does not extend into a sprained ankle. Those two facts, considered together, must indicate that something more serious is occurring. Let’s take a look at whether application of the SIRS criteria or qSOFA would have helped in this case. The qSOFA score was introduced in February 2016 as a simplified version of the SOFA score as a way to initially identify patients at high risk for poor outcome with an infection. The Sepsis-3 group advocates abandoning the SIRS sepsis screen, and noted that sepsis should be defined as life-threatening organ dysfunction caused by a dysregulated host response to infection. For clinical operationalization, organ dysfunction can be represented by an increase in the Sequential [Sepsis-Related] Organ Failure Assessment (SOFA) score of 2 points or more, which is associated with an in-hospital mortality greater than 10%. Septic shock should be defined as a subset of sepsis in which particularly profound circulatory, cellular and metabolic abnormalities are associated with a greater risk of mortality than with sepsis alone. The Sepsis-3 group, UpToDate, and others recommend abandon ing the SIRS evaluation and adopting qSOFA. SIRS relies heavily on abnormal vital signs and a known or suspected infection; it is known to be sensitive but not specific for sepsis. The qSOFA criteria includes change in mentation, a respiratory rate of 22 or higher, and a systolic BP <100 (1 point for each). Consider both approaches in this case. Using the SIRS sepsis screen, this patient would have been sepsis screen-positive based on an HR of 116, an RR of 22, and a temp of 100.4°F (38°C). Although arguably he did not have an apparent source of infection, the positive sepsis screen may have brought infection to mind and put it in the differential diagnosis. That may have made a difference; it may have impacted the practitioner’s thought process. In this case, the qSOFA score would have been negative, as the patient would only have a score of 1 based upon the RR of 22. So qSOFA would not have helped bring the presence of infection to mind. In this case, qSOFA would probably not have impacted the practitioner’s thought process. considers the possibility of infection, the faster the patient will get fluids, antibiotics and other key elements of sepsis intervention. TSG is not lobbying against qSOFA or for the SIRS screen, and this is but a single case review. However, early on in the infectious process, perhaps looking for end organ dysfunction is not adequately sensitive. And perhaps the SIRS screen, although overly sensitive, allows consideration of an infectious process that must be tied to the judicious application of clinical judgment.